The Calgary Heritage Initaitive presented its research to the Calgary Heritage Authority in July. As a result the Western Hospital was in October 2006 added to the Municipal Inventory of Potential Historic Sites as a 'Category A' building. From 1912 to 1923 the Western Hospital was at 351 – 13th Avenue SW, across from the First Baptist Church. You can see a photo of this building, now demolished, in the Glenbow archives using the keyword search term “Western Hospital”. Here is the link to the archives: http://ww2.glenbow.org/search/archivesPhotosSearch.aspx By the mid-twenties this building became a mortuary. It was demolished sometime after 1955. From 1923 to 1941 the hospital was in a converted house at 302, 14th Ave SW, on the NW corner of 14th Avenue and 2nd Street SW, across from Haultain school. The house still exists, pictured above. 302, 14th Avenue SW was built in 1909 as the home of H.P. Norton. A small ground floor addition on the western side of the house almost to the property line was added by 1911 according to fire insurance maps. The exterior of the house seems virtually unchanged since then. Norton lived there until 1911, then moved to Sunalta and then Mount Royal. He continued to own the house until 1922, renting to a variety of tenants. Norton was a farm implement salesman – first for Nichols and Shepard Co. Ltd. (1909), then as co-manager of Tuec Co. Ltd. (1912), then he ran his own companies, H.P. Norton Co. (1916), and Norton and Lief Co. (1920). In 1920 and 1921 he takes a turn as the manager of the St. Regis Hotel. http://www.regisplazahotel.com After that he disappears from the Hendersons Directories, and sells the house. 1913 – Bartley C. Nicklin, an electrician for Gracey-Crane Co.
1914 – Norman MacLagan, Manager of Rjay Cigar Stores Ltd.
1917-1919 – Florence Deller, who becomes Mrs. Florence Harness in 1919 (married to Mr. John W. Harness, a salesman at Nickle Boot Shops). 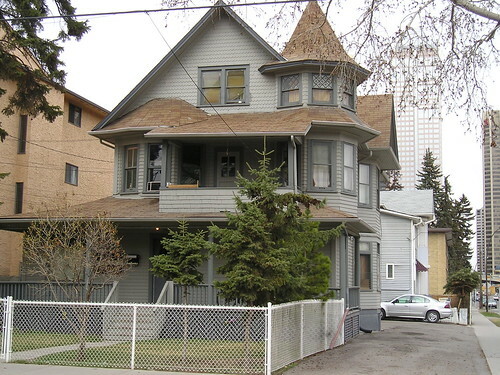 In 1919 she moves into a nearby house at 1417 1st Street SW, and operates 302 14th Avenue as a rooming house. 1920, 1921 – Albert Metcalf, taxi driver, proprietor of American Auto Livery. In 1923 H.P. Norton sells 302 14th Avenue to nurses Mrs. Veda Dyer Seller (nee Veda Dyer) and Miss Gladys Creeggan, who have been operating the Western Hospital since 1912 from a building on the other corner of the block. Seller and Creeggan move the Western Hospital to this location, and own the building until 1941. The Western is somewhat unusual in that it was privately owned by two nurses, was long-lived, lasting 30 years (including 20 years in the surviving building), and in that a wide variety of medical services were provided there be a variety of doctors from different practices. It served as a maternity hospital. In 1936 (for example) there were 26 births at the Western Hospital noted in the Calgary Herald out of 145 birth announcements listed for the year. Eleanor King Byers, author of The House With The Light On, a memoir of Calgary in the 40s and 50s, reports that "Both my brothers were born at Western Hospital: Stan in 1929, delivered by Dr. Charles Bouck; and Don in 1934, delivered by Dr. Albert Aikenhead." Dr. Bouck was a well-known Calgary surgeon with offices in the nearby Underwood Block. Dr. Albert Aikenhead was a founding member of the Calgary Associate Clinic, one of the premier medical practices of early Calgary. See below for more biographical information on these doctors. Dr. Gerald Milward McDougall, author of three books on the history of medicine and medical teaching in Alberta and Manitoba, was also born at the Western Hospital. Dr. McDougall is a decendent of pioneer Reverend George McDougall and his son John McDougall. Dr. McDougall's father worked for the CPR and his family was under the care of CPR divisional surgeons, the Mackid practice. It is presumed by Dr. McDougall that he was 'delivered' by a Mackid doctor. See below for more on the Mackids. W.H. (Danny) Copithorne reports having his tonsils out at the Western Hospital in 1939 by Dr. A.E. Shore of the Gunn, Hackney, Shore and Robbins practice. The practice (originally Gunn and Shore) was a major medical practice in Calgary between the wars, specializing in eye, ear, nose and throat. Gunn in particular is a major figure in Calgary (see below). In terms of a variety of services, a secretary to Calgary newspaperman/humourist Bob Edwards, a famous drunk, wrote that Edwards used to go to the Western's previous 4th Street location to recuperate after major drinking bouts. Edwards died in 1921. The hospital at its later location also treated injured oilfield workers. In the late 1930s-early 1940s one of the Western Hospital’s nurses was Annie McLeod, who is important to the history of nursing and hospitals in Southern Alberta. During the 1918-1919 flu pandemic, McLeod was the Matron of the V.O.N. hospital in High River. The V.O.N. hospital closed when the High River Municipal Hospital opened in 1921, and McLeod stayed on as Matron. Under McLeod, the High River hospital became the first municipal hospital in Alberta recognized as a training school for nurses. From 1921-34 the small school graduated 19 nurses. In 1924 her first two graduates received their diplomas and pins from the Prince of Wales, who had a nearby ranch. The school closed in 1934 and sometime after that McLeod went to work at the Western Hospital in Calgary. Source: Jack Peach ‘Thanks for the Memories’. Veda Seller and Gladys Creeggan closed the Western Hospital in 1942 and sold the building to retiree John Hurrell. 302 14th Avenue becomes a private residence again. 1942-59 home of John Thomas Hurrell (retired), and his wife Lucille. John dies in 1943 and his wife stays in the home until 1959. Last edited by Bob van Wegen on Wed Nov 01, 2006 8:06 am, edited 8 times in total. Eleanor King Byers, author of The House With The Light On, a memoir of Calgary in the 40s and 50s, reports that "Both my brothers were born at Western Hospital: Stan in 1929, delivered by Dr. Charles Bouck; and Don in 1934, delivered by Dr. Albert Aikenhead." On the occasion of his death in 1944, hundreds attended the funeral of Dr. Charlie Bouck.131 Many were his patients, as Bouck had one of the largest surgical practices in the city, and was known for his skill as far away as the world famous Mayo clinic.132 But more importantly, they came because of his tireless house calls, his countless trips to farms and small towns in southern Alberta, and his refusal to send a bill or accept payment from his less well off patients. Born in Iroquois, Ontario in 1886, Bouck came west with his parents in 1903.133 His father was a building contractor. After finishing high school in Calgary, Bouck returned east to attend the University of Toronto, where he earned his medical degree in 1911. He came back to Calgary to begin his practice. After three years overseas in uniform with the Canadian Army Medical Corps, Bouck took a post graduate course in Scotland before coming home, and was made a fellow in the Royal College of Physicians and Surgeons. Returning to Calgary in 1920, he resumed his practice in the Underwood Block. He soon established a reputation as an excellent surgeon, but perhaps more importantly, Bouck became known for his generosity and genuine concern for his patients. It was not uncommon for Bouck to leave formal dinners to respond to a call, or interrupt his bridge games, the busy doctor’s only hobby.134 In the age before state medical care, Bouck was loved and respected his willingness to treat the sick irrespective of their ability to pay. His dedication may have proved his undoing. Bouck’s health was undermined by his work, and he died of a heart attack at the age of 58. He passed away at his home in Mount Royal. Bouck had moved into 1014 Prospect Avenue in 1932.135 His widow Phyllis remained there until 1959 before moving to Wolfe Street. Danny Copithorne reports having his tonsils out in 1939 at the Western Hospital, by the Shore and Gunn practice. The good doctor was born in Beaverton, Ontario and attended the University of Toronto, graduating with a medical degree in 1902.432 He practised with his uncle, Dr. William Gunn, a famous surgeon, and was accepted to the Royal College of Surgeons of England in 1903. Two years later, he went to Vienna to specialise, and upon returning to Canada in 1907 came out to Calgary. Gunn quickly became established as the leading physician in his field in the city. He had joined the Canadian Army Medical Corps as a reservist in 1909, and when the war began, Gunn was made a major and sent overseas. In 1916, he was promoted to lieutenant colonel and given command of the 8th Field Ambulance unit. Gunn acquitted himself well and was awarded the Distinguished Service Order. After the war, he remained active in the militia, acting as assistant director of medical services for Military District 13, and organising the 8th Field Ambulance. Gunn took his military experience to the St. John’s Ambulance Association and was an integral part of the organisation, serving as president for two years preceding his death. His work with the association was recognised with a decoration in 1936 from Lord Tweedsmuir, the incumbent Governor General. Outside of medicine, Gunn was an ardent outdoorsman. He was an expert fly fisherman, and a charter member of the Calgary Gun Club. He bred top hunting dogs, frequently winning prizes at field dog trials. Ever the organiser, Gunn helped found the Alberta Fish and Game Association and was vice-president of the Calgary Fish and Game Association. Hunting and fishing were not his only outdoor interests: he was a member of the Alpine Club of Canada for over twenty-five years. Although he was a keen hunter, Gunn also became interested in wildlife photography, and in later years neglected his guns in favour of his camera. Last edited by Bob van Wegen on Thu Jun 08, 2006 9:20 am, edited 1 time in total. Last edited by Bob van Wegen on Thu Jun 08, 2006 9:31 am, edited 2 times in total. Albert Earl Aikenhead [graphic records] . -- 1 photoprint: b&w; 8 x 10 (21 cm x 26 cm) . -- 1948-1949. Dr. Albert Earl Aikenhead was born at Brucefield, Huron Country, Ontario, on 1882 April 24. He received his education at the County School, Clinton Collegiate and the University of Western Ontario from which he graduated in 1907. In addition to his studies there, he captained the football team. His internship took place at St. Joseph's Hospital in London, Ontario. From 1909 through 1912, he practiced at Hensall, Ontario. four other doctors, D.S. McNab, D.A. Lincoln, J.S. Murray and G.D. Stanley. He belonged to the Calgary Medical Society, Alberta Medical Association and the Canadian Medical Association. Dr. Aikenhead retired from active practice in 1947 May. A half year later, he was elected to City Council as an Alderman. During his term from 1948 through to 1949, he concentrated on plans to obtain a new General Hospital for Calgary. His main objective was being able to provide Calgarians with the best in hospital services. Dr. Aikenhead belonged to the Calgary Lawn Bowling Club of which, he was past-President of the Glencoe Club. He was the last surviving member of the five founders of the Calgary Associate Clinic at the time of his death in 1954 May.